Nubia Red Magic smartphone was launched last week as the first gaming smartphone by ZTE. Now, the handset has been made available through the crowdfunding site IndieGoGo. Early backers can get the smartphone for $399 (roughly Rs. 26,700), and the smartphone will start shipping in May. 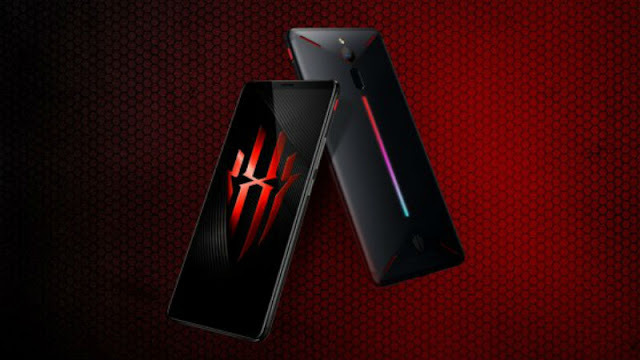 The company has stated that it will ship the Red Magic smartphone to India, Europe, the UK, and a host of other countries. However, interested buyers in the US and Canada will have to wait for the smartphone. The handset is currently listed on IndieGoGo for a month-long campaign to raise $50,000 (roughly Rs. 33,41,800). It already has raised over $30,000 (roughly Rs. 20,05,500) from more than 100 backers, reaching 61 percent of its goal with a month left for the fundraising campaign. The IndieGoGo campaign has several offers on the Nubia Red Magic smartphone. As per the first deal, you can buy the smartphone for $399 including shipping. This handset is equipped with Red Magic OS (China-specific OS) but it will not have Google Mobile Services (GMS). Buyers will also get a dBrand Black Camo Skin included in the shipment. This deal will expire on Saturday (April 27). If you pay for this deal, the company promises to ship the Red Magic next month. Nubia has another deal that is also priced at $399 including shipping charges. However, this handset will come with Vanilla Android 8.1 Oreo and not the custom OS. Also, buyers will get the dBrand Black Camo Skin. Notably, the estimated date of delivery is July 2018. There is a third deal on the Nubia Red Magic, priced at the same amount. Buyers will get the smartphone early but with a test version of stock Android 8.1 Oreo. It does not have the dBrand skin. You will have to join the company's development team, and the expected delivery date is in May 2018. Notably, all the deals have only one variant - 8GB RAM, 128GB inbuilt storage - of the Nubia Red Magic. While the smartphone will not ship to North America, the company has unveiled a voucher exclusively for North American customers. Buying the voucher worth $9 ensure a $50 discount when the goes on sale in the continent. The Nubia Red Magic was scheduled to go on sale on April 25, and it was priced at CNY 2,499 (roughly Rs. 26,000) for the 6GB RAM, 64GB storage variant, and CNY 2,999 (roughly Rs. 31,000) for the 8GB RAM, 128GB storage variant. To recall, the key features of the Nubia Red Magic include its air-cooling technology, gaming mode that optimises performance and disables notifications to prevent interruptions, a 16.8 million colour RGB LED panel at the back, and an aviation-grade aluminium alloy build with a diamond-cut surface and 'vector aesthetics'. In terms of specifications, the Nubia Red Magic is a dual-SIM (Nano) smartphone that runs Nubia Red Magic OS that's based on Android 8.1 Oreo. It sports a 6-inch full-HD+ (1080x2160 pixels) LTPS TFT display and is powered by the Qualcomm Snapdragon 835 SoC. It comes in 6GB and 8GB RAM variants. The Nubia Red Magic features a 24-megapixel rear camera and an 8-megapixel camera. It bears either 64GB or 128GB of inbuilt storage, not expandable via microSD card. 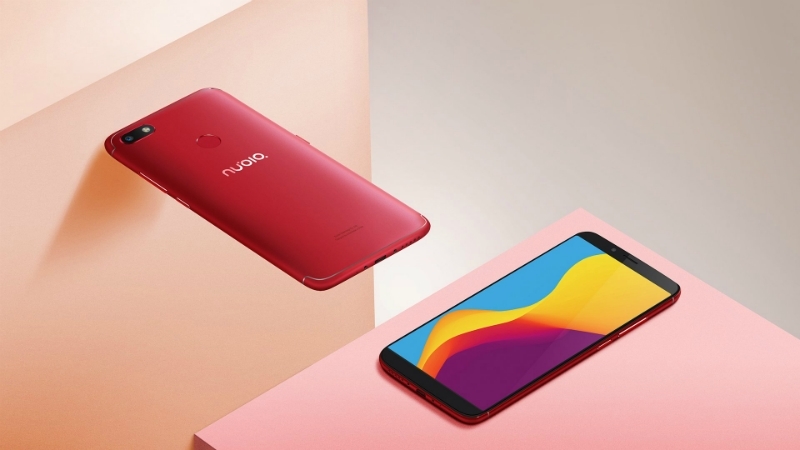 The connectivity options in the Nubia Red Magic include 4G VoLTE, Wi-Fi 802.11ac (dual-band, 2.4GHz and 5GHz), Bluetooth v5.0, GPS/ A-GPS, USB Type-C, and a 3.5mm headphone jack. Sensors on board include an accelerometer, ambient light sensor, gyroscope, magnetometer, and proximity sensor. The handset is fuelled by a 3800mAh non-removable battery with NeoPower 3.0 and Nubia fast charging capabilities. It also comes with a TAS2555 amplifier for improved audio performance and DTS Audio support. ZTE brand Nubia has launched the Red Magic gaming smartphone, as it had announced earlier this week. The highlight of the smartphone is its air-cooling technology with other thermal dissipation improvements, apart from its gaming mode that optimises performance and disables notifications to prevent interruptions. Another highlight feature is its design, featuring a 16.8 million colour RGB LED panel at the back and an aviation-grade aluminium alloy build with a diamond-cut surface and 'vector aesthetics'. It is surprisingly powered by the now dated Snapdragon 835 SoC, but also features up to 8GB of RAM. The launch by Nubia follows the launch of the Xiaomi Black Shark gaming smartphone last week. Nubia Red Magic price, availability The Nubia Red Magic price starts at CNY 2,499 (roughly Rs. 26,000) for the 6GB RAM, 64GB storage variant, going up to CNY 2,999 (roughly Rs. 31,000) for the 8GB RAM, 128GB storage variant. The smartphone is up for pre-orders, and will go on sale from April 25. Nubia Red Magic specifications The dual-SIM (Nano) Nubia Red Magic runs the Nubia Red Magic OS that's based on Android 8.1 Oreo. The smartphone bears a 6-inch full-HD+ (1080x2160 pixels) LTPS TFT display that provides an 85 percent screen-to-body ratio. It is powered by the Qualcomm Snapdragon 835 SoC (four cores clocked at 1.9GHz and four cores clocked at 2.36GHz) coupled with 6GB or 8GB of RAM depending on the variant. The Nubia Red Magic bears a 24-megapixel rear camera with a ISOCELL image sensor, an f/1.7 aperture, and a 6-piece motor driven lens. On the front, it bears an 8-megapixel camera with a BSI sensor, an f/2.0 aperture, 76-degree wide-angle lens, a 3-piece lens. It bears either 64GB or 128GB of inbuilt storage, not expandable via microSD card. Connectivity options include 4G VoLTE, Wi-Fi 802.11ac (dual band, 2.4GHz and 5GHz), Bluetooth v5.0, GPS/ A-GPS, USB Type-C, and a 3.5mm headphone jack. Sensors on board the Nubia Red Magic include an accelerometer, ambient light sensor, gyroscope, magnetometer, and proximity sensor. It is powered by a 3800mAh non-removable battery with NeoPower 3.0 and Nubia fast charging capabilities. It also bears a TAS2555 amplifier for improved audio performance and DTS Audio support. 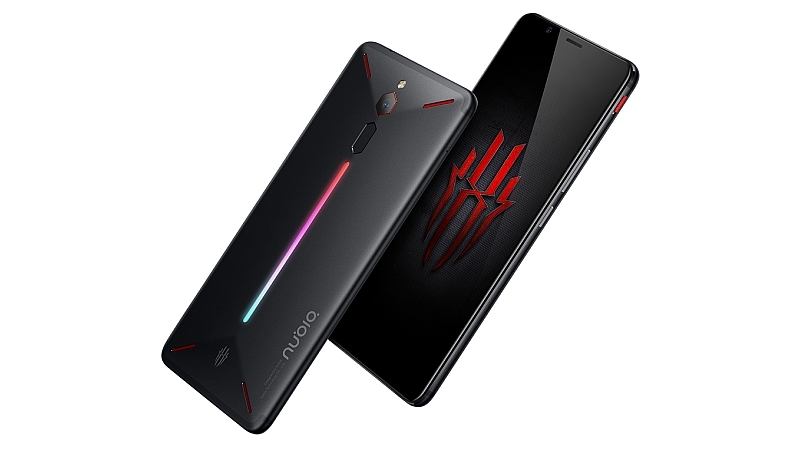 Nubia Red Magic features As we mentioned, the Nubia Red Magic sports air-cooling technology with nine air radiation slots to assist in thermal dissipation, apart from three-layer graphite lamination technology. The dedicated gaming button lets users activate gaming mode, which gives users the option to disable incoming calls, messages, and other notifications for an uninterrupted gaming experience. The button also enables increased gaming performance with a 'turbo acceleration mode', and the company says it has been optimised for 128 games for now to provide improved performance and faster game loading speeds. ZTE’ child brand, Nubia has announced the Z18 mini smartphone in its homeland China. The device sports decent specifications for the asking price. The Z18 mini comes in four different colour options: Black, White, Blue and Pink, but there’s no hint at the phone launching in the Indian market. The device comes in various memory and storage configurations, and Nubia has revealed the pricing details of every variant. The USP of the smartphone is its design and powerful mid-range hardware. Also, the Z18 mini joins the list of few smartphones to feature the Qualcomm Snapdragon 660 SoC. It comes with up to 6GB of RAM and 128GB of internal storage. Matching the trend of 18:9 display smartphones, the Nubia Z18 mini also comes with a 5.7-inch 18:9 display with 2.5D curved glass on top. It’s powered by the Qualcomm Snapdragon 660 chipset, paired with 6GB of RAM and 64GB/128GB of internal storage. Graphics in the smartphone are taken care by Adreno 512 GPU. This dual-SIM smartphone comes laden with Android 8.1 Oreo out of the box with nubia UI on top. There’s a whopping 24MP primary camera at the back, paired with a secondary 5MP camera. The primary sensor has a f/1.7 aperture, PDAF. It also has a dual-tone LED flash. An 8MP selfie shooter is present on the front with 80-degree wide-angle lens. The phone has a fingerprint scanner located on the rear side. The device measures 7.6mm in thickness and weighs 153grams. It also offers 4G LTE, VoLTE, Wi-Fi 802.11 b/g/n/ac, GPS, Bluetooth 5.0 and a USB Type-C port. Powering this package is a 3450mAh battery. Moving onto the pricing, the Nubia Z18 mini comes in a plethora of storage options. The base 6GB of RAM and 64GB storage model costs 1799 Yuan (approx. Rs 18,700), and the 6GB RAM & 128GB storage model costs 2099 Yuan (approx. Rs 21,780). There’s a Limited Provence Edition of the Z18 mini with 6GB of RAM and 128GB of storage and it retails for 2199 Yuan (approx. Rs 22,700). As mentioned, the Nubia Z18 mini, for now, is limited to the Chinese market, but it might soon launch in the Indian market as Nubia did not have any major launch in the country for quite some time. 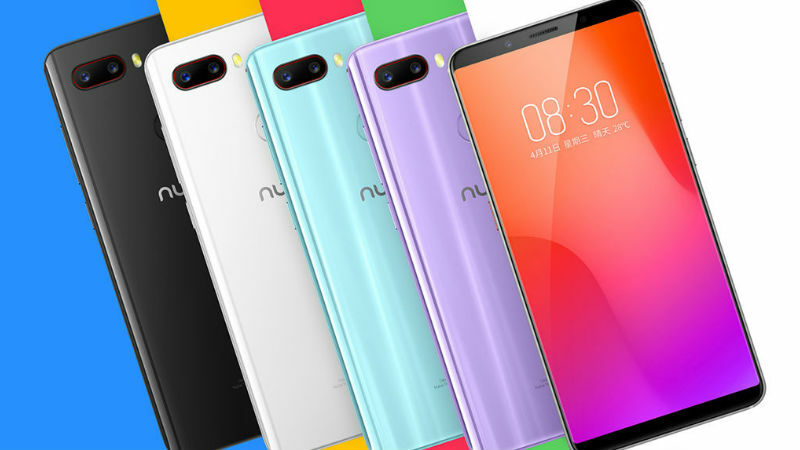 The sub-brand of ZTE – Nubia, recently was in the news for launching its latest smartphone the Nubia N3. Shortly following that, the company decided to make a new development in the series by introducing yet another smartphone, the Nubia V18. The 18:9 aspect ratio smartphone runs on the Snapdragon 625 SoC and 4GB of RAM and has a 6.01-inch display. Although, the Nubia V18 lacks on the camera front as it doesn’t have a dual camera setup but the company ships the phone with its own Maverick Voice Assistant and also the much-expected face and fingerprint unlock sensors. The colour variants available for this new phone are Stone Black, Space Gold and Nebula Red. The price tag of the phone comes to be at CNY 1,299 translating roughly to Rs 13,400. The pre-orders for the newly launched phone start on Thursday, and the sales start on March 29 in China. The Nubia V18 fashions an attractive 6.01-inch full HD+ display with an 18:9 aspect ratio and 1080×2160 pixel resolution. It also has dual nano-SIM card slots and is powered by the Snapdragon 625 Soc which is clocked at 2.0GHz and also an Adreno 506 GPU to support the graphics. The RAM on this device is 4GB, and the phone runs on Nubia UI 5.1 which is a UI based on top of Android Nougat. On the rear camera side, we get to notice a 13MP shooter with a f/2.2 aperture with PDAF while on the front side the Nubia V18 offers an 8MP shooter with f/2.0 aperture for selfie purposes.One drawback which the customers might point out is the availability of only one variant in terms of internal storage – 64GB, however, the phones does offer a microSD card slot which can be used to expand the memory to up to 128GB. The device also shines in the power department by offering an enormous battery of 4,000mAh. The phone is also equipped with all necessary sensors like accelerometer, compass, ambient light sensor, and proximity sensor and also offers a wide range of connectivity options like 4G VoLTE, Wi-Fi 802.11 b/g/n, Bluetooth 4.1 LE, GPS, and GLONASS. While talking about dimensions we get to see that the phone has pretty thin form factor even though it houses a heavy battery, with the sides measuring to 158.7×75.5×7.75mm the device manages to weight 170 grams. Chinese handset maker ZTE is rumoured to launch its new budget smartphone, Blade V9, at Mobile World Congress 2018 in Barcelona. Online reports suggest that the upcoming Blade V9 will be "quite affordable" considering its placement in the budget segment. A report by Android Headlines suggests that ZTE has plans to unveil its Blade V9 at the MWC tech show later this month. The phone is expected to have a shell made out of metal and glass. According to the report, the upcoming smartphone will sport a 5.7-inch full-HD+ (1080x2160 pixels) display with an obvious 18:9 aspect ratio and on-screen buttons. Apart from that, the Blade V9 is expected to sport a 64-bit, octa-core Qualcomm Snapdragon 450 SoC, coupled with 2GB/ 3GB/ 4GB RAM and 16GB/ 32GB/ 64GB of inbuilt storage. The Blade V9 is also rumoured to have a microSD slot for storage expansion. In the camera department, the phone is expected to sport a dual rear camera setup, with a 16-megapixel primary sensor and a 5-megapixel secondary sensor. The selfie camera is rumoured to feature a 13-megapixel sensor. The report also suggests the phone will feature a 3200mAh non-removable battery, Android 8.0 Oreo out-of-the-box, a 3.5mm headphone jack, Bluetooth 4.2, and 4G VoLTE. Renders show a rear-mounted fingerprint sensor as well. Dimensions of the handset are claimed to be 151.4x70.6x7.5mm and the weight is supposed to be 140 grams. 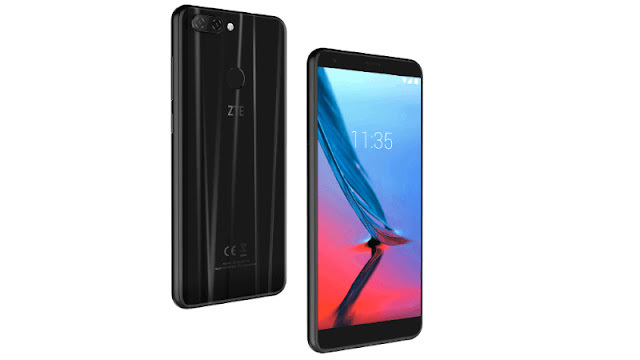 The ZTE Blade V9 was previously spotted on ZTE's Spanish website, where most of the specifications and images were leaked. This might be the successor to ZTE Blade V8, which was launched at CES 2017. The Blade V8 had a 5.2-inch full-HD (1080x1920 pixels) LCD display, alongside 2GB/ 3GB of RAM and 3GB/ 32GB of inbuilt storage.